Popular Mechanics has long profiled interesting new ideas and inventions, even if those innovations were destined to go no further than the magazine's pages. Even in the early 20th century, there was still a frightening amount of housework needed to keep the average home running. The "Electrified Kitchen Cabinet" was intended to help the modern housewife solve that problem... in very specific ways. The Kitchen Cabinet could knead bread, chop food, and make ice cream by means of attachable hardware connected to belts and motors. It also had an automatic dishwasher and "a clock to break the circuit and the required moment, so that constant attention to the work in hand is not required." The plans for the mighty Sea Tank were submitted to the Council of National Defense in 1917. Meant to assist in beach landing offensives (it was referred to as "somewhat" amphibious), the Sea Tank was basically two water wheels with gun turrets for hubcaps, as well as another turret mounted in the center of the axle. The axle would hold the landing crew as well. How was it supposed to move? With some complexity. "Powerful motors mounted on heavily weighted sliding platforms in the lower part of each drum engage cogged rings encircling the inner circumference of the cylinders. In tending to climb the latter they impose weight that revolves the drums and causes paddles to send the craft forward." 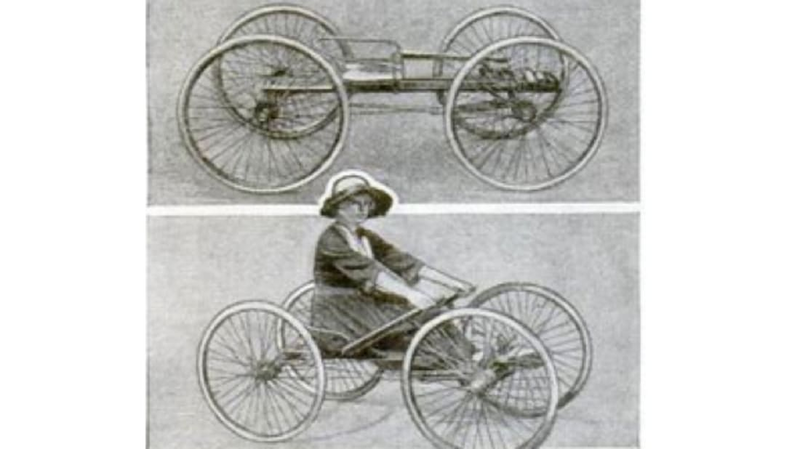 While some "almost-inventions" seemed to lay clear paths to failure before they ever came off the drawing board, others really seem like they could have made it. The Convertible Desk is a clever space saver, combining the nooks and crannies of a roll top with the ability to expand usually only found in Grandma's table at Thanksgiving. Fold the desk top wings once to have downward access to files and assorted necessities, and flip the folds to create a large drawing board. This beautiful piece of engineering might have actually been built if WWI hadn't come along. 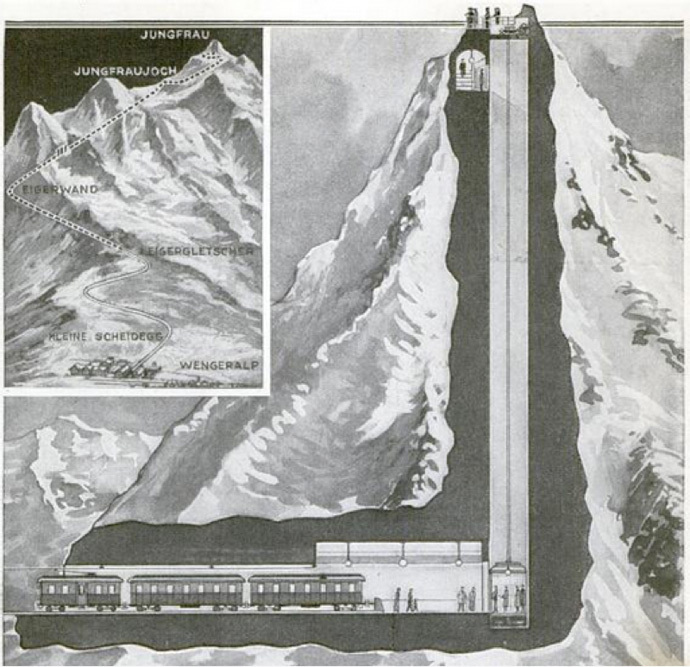 The Jungfrau railroad was built over the course of 16 years, finishing in 1912. It was meant to increase tourism to that particular region of the Swiss Alps, by bringing passengers a good deal up the summit of the famous mountain. The elevator was intended to bring them the rest of the way, 2206 feet straight up. Though the elevator was never made, the Jungfrau train station is still the highest in the world, and its terminus under the mountain contains many caverns and tunnels designed to delight tourists. This "Submerging Boat," meant exclusively for fun and frolic at the beach, falls into the category of "What an incredible idea! That makes no practical sense!" 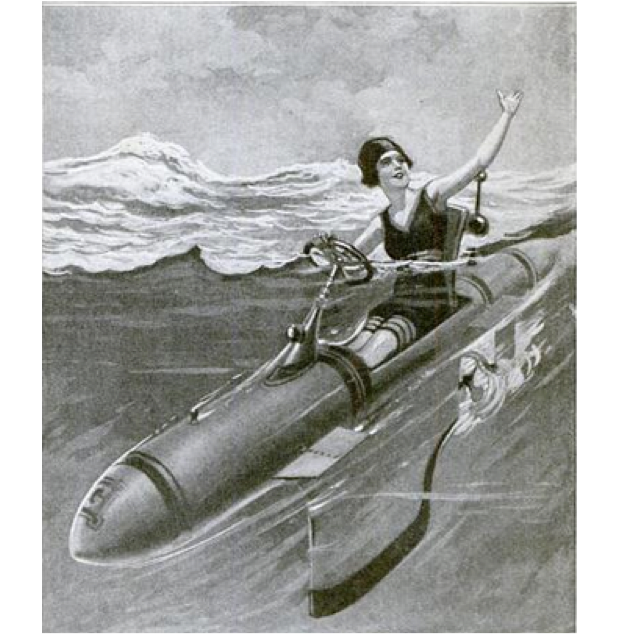 It was neither a real submarine nor a personal speedboat of any merit. The depth it could reach was controlled by four "planes" mounted on the sides of the vehicle, which the driver controlled with foot pedals. The wheel controlled the rudder, and to prevent drowning there was a "buoyant ball mounted on a tubular guide on the stern of the boat." When the water pressure of the sinking vessel caused the ball to rise too high, it would strike a switch that cuts off the motor, keeping the passenger bobbing shoulder deep in the water. 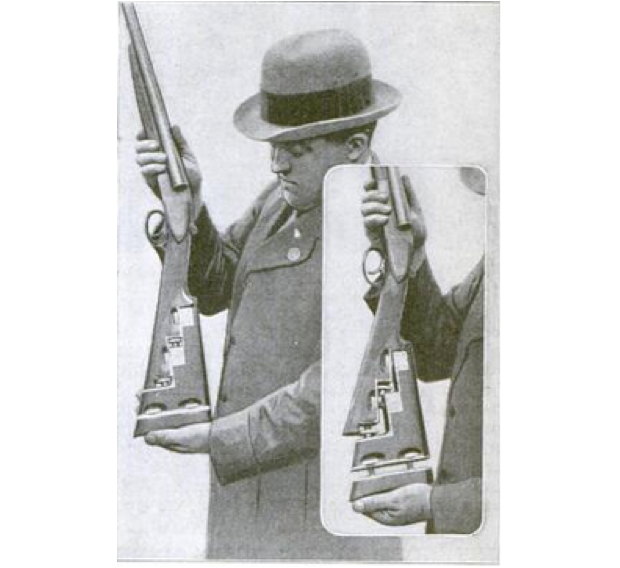 The adjustable, shock-absorbing gunstock was intended for the lady sportsman, whose love for athletics might not be outweighed by a sore shoulder from that nasty kickback. The stock could be lengthened or shortened to meet personal preferences by means of setscrews, and, reportedly, 70 percent of recoil was absorbed by the springs placed with the setscrews. 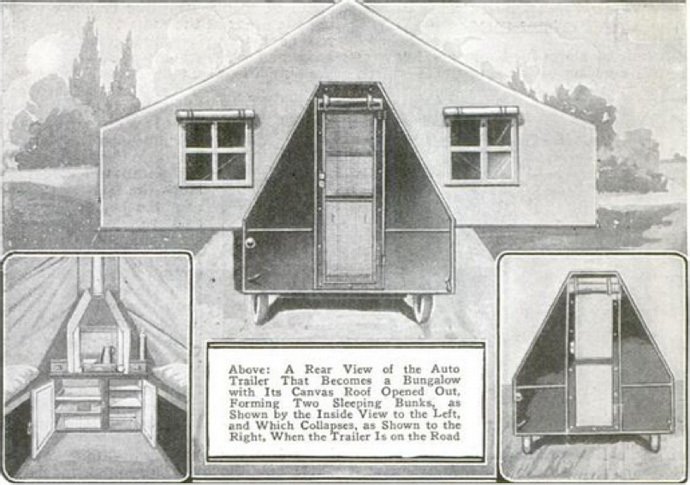 This 1918 "Elaborate Auto Bungalow" prototype looks similar to the recreational vehicles that would succeed it decades later. Except this one is quite a bit fancier, used by Captain Charles Percival, Chief of Staff of the U.S. Veterans of Foreign Wars, as he toured the country. It had a hardwood body with room for a typewriter desk, sink, water tank, and cabinets. Ahead of its time, but not by far. In 1918, the newest form of transportation in Paris was the hand-powered buckboard scooter. 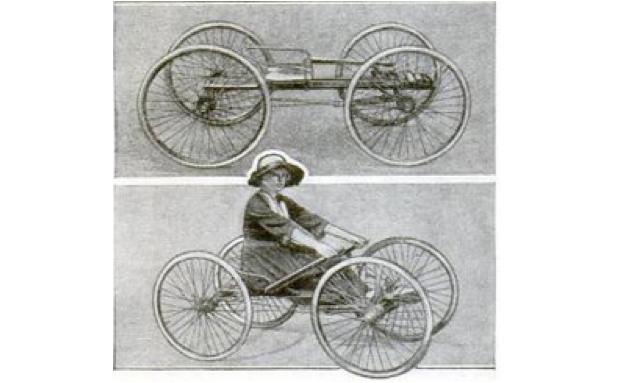 This "velocipede" was meant to be propelled with the same action as boat rowing, except with handlebars instead of oars. Steering? Why, you'd do that with your feet, of course. The 5-in-1 playground is clever—and not even remotely safe. The slide was the starting point for all the other toys. 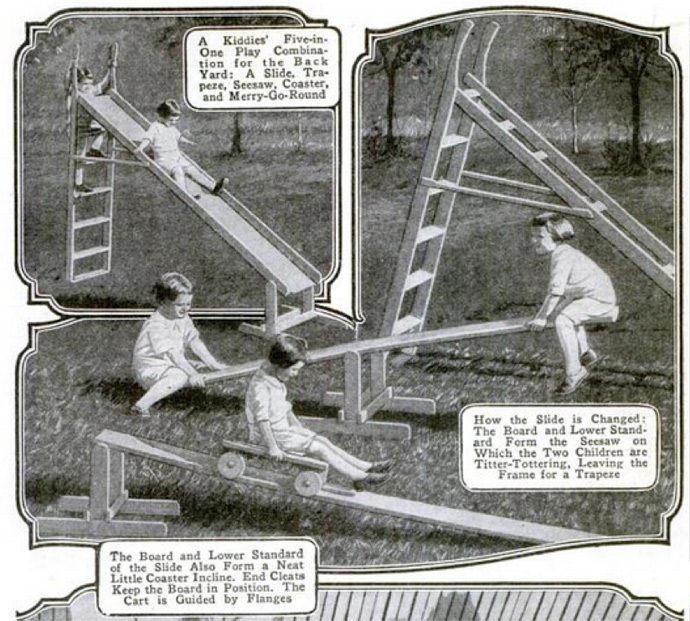 Remove the slide board and place it over the "lower standard," and you'd have a teeter totter, plus monkey bars where the slide used to be. The board and lower standard could also support a little roller coaster, which was kept on track with flanges. We certainly don't advocate that talented home craftsmen try to recreate this perilous structure... but we do wish our own dads had thought to do it.